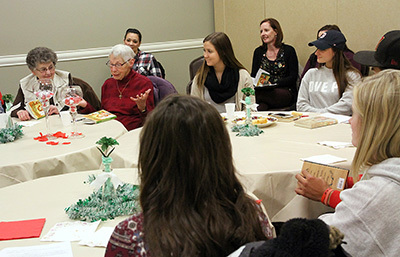 Minot State University freshmen enrolled in Leisa Harmon’s University Studies 110 class are facilitating a book club, which is reading Laura Ingalls Wilder’s “Little House in the Big Woods,” at the Parker Senior Center. The university students lead the group, which is attended by senior citizens. They meet to discuss their memories of themes related to the book. The University 110 class is part of a First Year Learning Community cohort, which is three separate classes tied together by a common theme. The three classes are “Survey of Communication Disorders,” “Children’s Literature” and “First Year Seminar.” The cohort of students is enrolled in all three classes. Faculty members Nicole Thom-Arens, Erin Holt and Harmon meet regularly to integrate information and assignments for the three classes in the Learning Community. The book club is the community-based service learning project that integrates the content of the classes. For questions, contact Harmon at Leisa.Harmon@minotstateu.edu. Ryan Stander, art assistant professor, will present “Lasting Influence: The Art of David Driesbach and John Kaericher” Thursday (March 9) in Aleshire Theater at 7 p.m. He will receive assistance from Dan Conn, teacher education assistant professor, Micah Bloom, art assistant professor, and art students Hannah Streccius, Katie Abrahamson and Cera Pignet. This presentation, which is free and open to the public, is part of the Northwest Art Center lecture series. Stander initiated conversations in 2014 with Driesbach, a noted Chicago printmaker, that led to the donation to the Minot State University Permanent Art Collection of more than 60 original etchings and lithographs. Both featured artists, Driesbach and Kaericher, studied under Argentinian-born artist Mauricio Lasansky at the University of Iowa, Driesbach in the 1950s and Kaericher in the 1960s. The younger Kaericher also later studied under Driesbach, and Kaericher would eventually teach Stander. An informal reception will follow. This program is funded in part by a grant from the North Dakota Council on the Arts, which receives funding from the state legislature and the National Endowment for the Arts. For questions, contact Veikley at avis.veikley@minotstateu.edu. The Division of Science is hosting a regional Science Olympiad Monday (March 13) on the Minot State University campus from 8:30 a.m. until 4 p.m. Middle school and high students from area schools will participate. Team registration is in Ann Nicole Nelson Hall at 8 a.m.
“Minot State’s Science Olympiad is one of five regional events in North Dakota, and the winners advance to state competition in April,” said Robert Crackel, MSU chemistry associate professor and Science Olympiad regional coordinator. To date, 17 B-division teams and 12 C-division teams have signed up. Participating schools are Bishop Ryan, Cavalier, Century High School, DLB, Drake-Anamoose, Erik Ramstad, Garrison, Glenburn, Jim Hill, Minot High School, Nedrose, Rugby, South Prairie, Stanley, United Public #7, and Velva. For questions, contact Crackel at 858-3852 or robert.crackel@minotstateu.edu or JoAnn Schapp, Bishop Ryan Catholic School science teacher and Science Olympiad regional coordinator, at Joschapp@brhs.com. March is Transgender Awareness Month and in honor of that, the MSU Gay-Straight Alliance will host a workshop/discussion on March 21 and March 24 in Swain Hall 112, noon-12:50 p.m. There will be riveting discussion and a great educational opportunity for anyone who wants to know more about what it means to be transgender or about GSA on campus. The over-all theme for the workshop/discussion is “Would transgender people exist if gender did not exist?” For questions, contact gsaclub@minotstateu.edu. Comedian Eric O'Shea will take the mic March 21 in Ann Nicole Nelson Hall at 7 p.m. MSU Life sponsors this event, but it is free open to the public. For questions, contact Aaron Hughes, student activities coordinator, at aaron.hughes@minotstateu.edu. All Minot State University students, faculty and staff are invited to meet local area law enforcement officials March 22 for coffee and conversation. The event will be in the Beaver Dam from 9 to 11 a.m.
Eric Furuseth, associate professor of humanities, will present “The Broken Dandy: The Satirical Narrator of Byron’s ‘Don Juan’” March 22 for The Two-Minute Lecture Series. He will be in the Beaver Creek Cafe by the curved wall at 12:30 p.m. Come on out and time it. On April 12, Ash Bowen, English assistant professor, will discuss “Lie and Fact in Geoffrey Brock's ‘And Day Brought Back My Night.’” For questions, contact Robert Kibler, co-chair and professor within the Division of Humanities, at Robert.Kibler@minotstateu.edu. For individuals planning to use the Dependent/Spouse Tuition Waiver for this upcoming summer or fall 2017, a new application is available. View the application/policy and complete and submit it to the Financial Aid Office. If individuals completed the form in the past, no other additional documentation is needed. For questions, contact Lindsey Benson, assistant financial aid director, at 858-3342 or lindsey.benson@ndus.edu. To commemorate World Hearing Day (March 3), Minot State University’s Department of Communication Disorders, in conjunction with the National Student Speech Language Hearing Association, and CD 513 Assessment students offered free hearing screenings to MSU students, staff and faculty and the public in the Communication Disorders Clinic. Strategies to mitigate hearing loss and its consequences include prevention, screening for early identification, rehabilitation through hearing devices, captioning and sign language education. World Hearing Day 2017 highlighted actions which can be undertaken by decision-makers to address hearing loss. For additional information, contact Magnus at lesley.magnus@minotstateu.edu. The Minot Area Chamber of Commerce Governmental Affairs Committee hosts Saturday legislative forums at the North Dakota State Fair Center, with the next forum March 18 at 9 a.m. The forums give attendees a chance to meet with Minot area legislators and ask questions. The format includes a moderator who asks questions submitted in writing by the audience. Each session runs from 9 to 11 a.m. at the NDSF Center. The last scheduled forum is April 1. March 8-30 — Print and drawing exhibit by Iowa artist John Kaericher, Library Gallery. March 8-30 — “Spectacles, Top Hats and Ties: David Driesbach Prints,’ by Chicago printmaker, Hartnett Gallery and Flat Tail Gallery. A public reception for the exhibits will be Thursday (March 9) in the three galleries from 6:30 to 8:30 p.m. An interpretive lecture, “Lasting Influence: The Art of David Driesbach and John Kaericher,” will start in Aleshire Theater at 7 p.m.
Emily Taylor, Minot State University alumna, won a weeklong scholarship to the Stagecraft Institute of Las Vegas, when she recently competed in costume design at the Region 5 Kennedy Center American College Theater Festival in Des Moines, Iowa. She earned a bachelor’s degree in history from Minot State University in 2016 before pursuing a master’s degree in theatre at the University of North Dakota. Linda Olson, art professor, is one artist participating in Art50!, exhibitions celebrating the North Dakota Council on the Arts’ 50th anniversary. The North Dakota Art Gallery Association and NDCA, with support from Starion Bank, organized two exhibits to celebrate the anniversary. One exhibit is in the Heritage Center, while the other is touring the state during this anniversary year. NDAGA is headquartered at Minot State University. Olson’s work will also be on display in the Gov. Doug Burgum’s ground-floor office, the first lady Kathryn Helgass Burgum’s fourth floor office, and the attorney general Wayne Stenehjem’s first floor office in the State Capitol in Bismarck. Holly Pedersen, Department of Special Education chair, Heather Lee, special education instructor, along with special education undergraduate students Margaret Brown, Tammy Fischer and Allie Huston, gave two presentations Feb. 3 at the North Dakota Council for Exceptional Children annual conference in Bismarck.